New Year has just arrived! If you had ever surfed the Internet during the time, you could find that many sites wear a new fresh logo, which looks just fabulous. So have you ever thought of designing your own logo for social channels, podcasts or websites, or even designing a logo for the T-shirt? Something creative will bring a good & fresh user experience, which makes your brand stand out. Are you with us on this point? Let’s start. A few Days ago, our team is contacted by DesignEvo and introduced with the free logo maker, which we find it very intuitive, sleek and good for DIY an effective logo. And we really have a good time by playing around with it. So we assume you guys will like it as well and decide to give it a try. DesignEvo is an online free service for instant logo creation that can be used to customize any 2D logo by all-level designers. Even if you are a computer rookie, you can still find it a lot of fun and handy. All features are well designed and can be found without any difficulties. Logo icon, logo text & logo shape are essential for a logo design. Therefore, DesignEvo takes these features as its major function modes and lists them in the left bar. Especially, you will find its logo icon very easy to use since it endows you with searchable selections. On the top, a selection of fine editing choices is demonstrated, mainly are about retouches. In the major block is your canvas. All in all, it’s the easiest logo maker that we’ve ever tried and the results are not bad. Go straight for [Make a Logo for Free] after landing its homepage. It will take you to the online logo app, that’s where your operation pane is. Tips: For those who don’t use English as their mother tongues, or can’t understand English very well, DesignEvo offers local translations for Español, Português, Deutsch, 日本語, 繁體中文 and 简体中文. The language switching box can be found on the bottom of DesignEvo homepage. 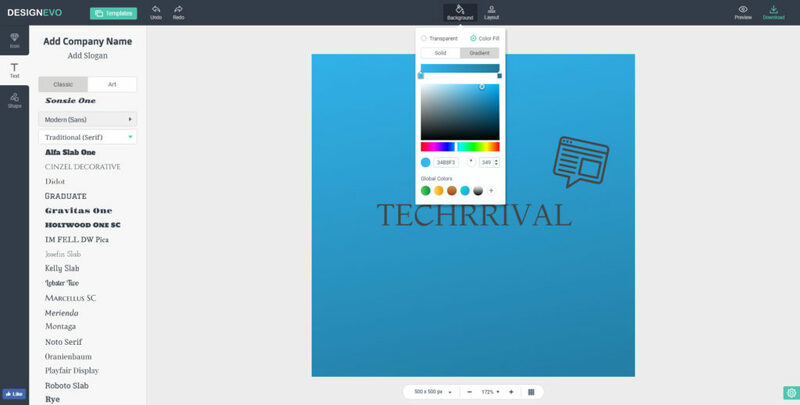 In the rest steps, we will make a logo for TECHRRIVAL from scratch as the example. And you can follow our steps to design yours. Choose [Text] and select between [Classic] and [Art]. Since we decide to make a WordPress logo, we will use some elements that are WordPress-ish. So what we do next is to hit [Traditional]>[Montaga] under [Classic]. Double-click the logo text instance and paste TECHRRIVAL. On the top bar, change its font size to 46 and its color to . Then, drag and drop the text to a proper position. The logo without WordPress elements won’t feel right. So what we do is to try to find something WordPress-ish from the Icon. We choose a WordPress dialogue icon. We use a little trick in changing icon colors, which is making sure our icons are in the same color scheme. In the process, we suggest you select your text color, copy its 6-digit color out to the icon. If you want a different color, you can change icon color position vertically (or horizontally), after that, the icon colors will look more natural and harmony. After that, select all logo elements, drag and move them to the center. Adding the background color is supported. Click [Background], use [Gradient], and go for WordPress logo color in [22769B] and set it as the end color. Soften the color by moving it upward and set it as the starting color. After the logo is made in raw, you can preview it with DesignEvo preview feature. It can be found on the very top of the interface. You can glance at your logo showing on a business card header, on a notebook cover, in a website, on a white T-shirt, on a wall screen, etc. Immediately after we have our logo designed, we preview it by pressing [Preview] on the right top. See, using DesignEvo to design a logo is super easy, very intuitive and highly efficient. Plus, DesignEvo is free for all-level designers, for now, that has all logo features as one-stop logo solution. Eventually, you can get three logo files by downloading, which is a png with a white background, a jpg with a white background, and a png with transparent background. Usually, a png with a transparent background is mostly used among websites and wordpress blogs. Designing a logo in DesignEvo requires no design skill and its logo design solution is streamlined and easy and its results are satisfying. A Business must have a brand & unique logo, As logo present personality of company & brand. I have see many post about Logo Design for a Business & I do understand value of Logo. If we talk about big brands, So they have amazing logo. So logo for a business or brand is important.